Being at sea for thirty-eight days, with forty-nine people to feed three times a day, does not seem to concern Head Chef John Haughton and Chef Tulip. It's all in the planning, they say. And, of course, careful stock management, keeping a log of everything that gets used, to plan what they need to order. You soon realise that everything that happens at sea needs to be logged. But how do they plan menus for more than five weeks at sea? The galley team use their culinary skill to create the menus to suit the crew and scientists, combined with what the store cupboard has to offer. They cope well with a variety of special diets, offering balanced nutrition and a great choice - meaning there is something to suit all tastes. No-one goes hungry aboard the ship. Using the local shipping agent as a 'shopper', the galley team use as much locally sourced produce as possible when they are in port. But they also need to develop a good 'nose' for what to buy where - instead of choosing between which shops to buy from, they choose which country to buy from, depending on where the ship is docking next. 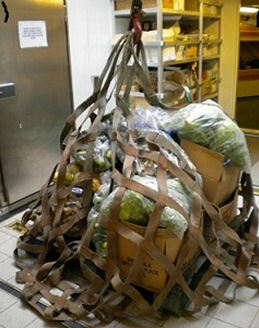 All meat and fish comes aboard frozen - there are freezer facilities for storage, but not for freezing fresh foods. There is always a good store of dried, tinned and frozen foods, which gives us our variety of meals. Using the most perishable foods first means we can look forward to have fresh fruit and vegetables throughout our journey. For example, oranges, apples, pineapples and grapefruit can be eaten later in the journey, but we're eating the strawberries and grapes now. With forty-nine people to feed, on different working patterns, John and Tulip are supported by Graham and Amy during serving times. 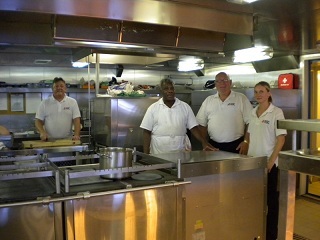 Whether in stormy seas or the calm of the Caribbean, working in the galley is not for the fainthearted. The working area is always on the move, with sharp instruments and hot liquids around, but they always have a smile! So having given you a view of how the scientists live on board, tomorrow we get on with the business of science. Only 24 hours to go before we arrive at our target area, and we're in the final stages of planning how and when each piece of equipment will be deployed.